Goddamn, I love Blue Man Group. 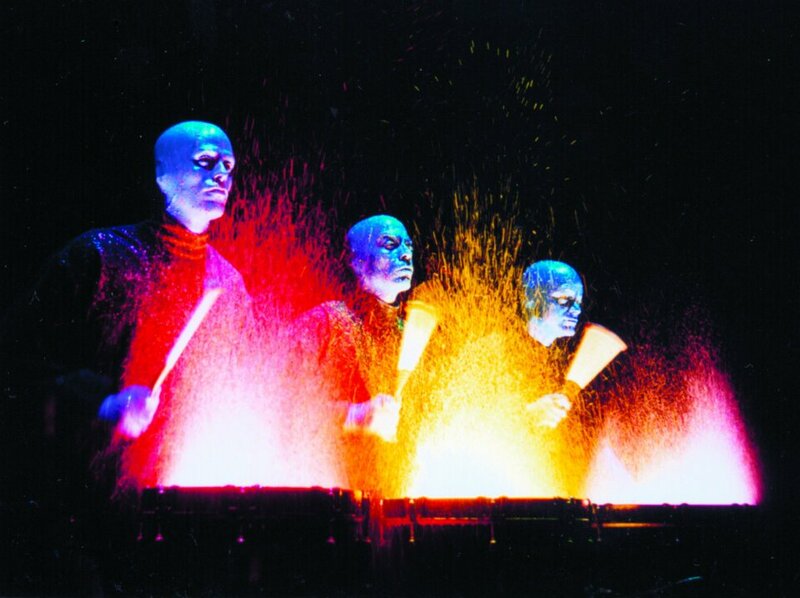 Blue Man Group take my breath away with their charm and whimsy, and how much they can convey without uttering a single word. With a turn of the head or a subtle gesture, we the audience know exactly what the joke is. And holy crap, the drumming. Lots of things make me wish I knew how to play the drums, but this makes me want to whale on a giant drum like nobody’s business. If you’ve never seen them and have no idea what I’m talking about….well, you’re missing out. They’re kind of impossible to describe – even their own website is mostly pictures and video, without trying to articulate quite what they are/do. I first remember the Blue Men coming onto my radar with those commercials they did for Intel back in what must have been the late 90s and early 00s. Then my dad and I had to go to Vegas for business, and I wanted to see a show. “I don’t like plays,” he said. Fine. I would find something non-play-like and make him admit he liked it. Enter Blue Man Group. And he loved it. So much so that he has also seen them three times now. You’re welcome, Dad. Music. But mostly percussion. Rhythmic movement, but not really dance. Humor, but not really comedy. Audience interaction. Lights, sound, drumming on all sorts of things. Gigantic floaty ball thingies. Exploding streamers. See. Impossible to describe. Magical. That’s what I should’ve said from the beginning and just stopped trying. A big, enchanted dance party. That magical feeling is part of what I love so much about the live theater experience. There’s nothing like it. And perhaps seeing Blue Man Group for a third time is excessive (although I would happily see them again), but I want to support freakin’ awesome shows like this being brought to Fort Wayne. I want them (them? the powers that be? promoters? who knows…) to see that there is an audience here. I will spend my dollars on quality productions that come to my doorstep. Please feed my theater hunger. I’m not used to going to bed high on theater right here at home; I like it! Okay, I’m almost talked into seeing them. ALMOST????? What’s it gonna take, missy?? OMG, could not possibly agree more. As a theater/lighting/show/wannabe-drummer-person it appealed to every part of me that isn’t dedicated to thinking about women and beer. One of the really great things about it is that the shows you saw are probably pretty different from the ones I saw. The format gives them the ability to be almost infinitely creative and it totally shows.